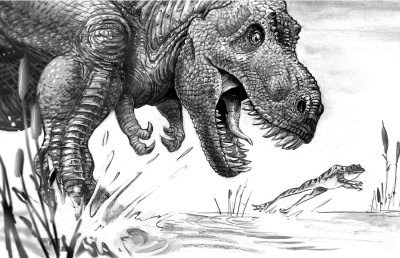 Over at his VonShollyWood blog, out pal Pete has a bunch of his great unused art from some big dinosaur movie from some years ago. Pete does not say what it is but I suspect that it was Disney’s Dinosaur (which I never did see – talking Cretaceous gibbons? No thanks!). Anyhow, check it out HERE. Be warned that not all the language Pete’s uses is squeaky clean, so discretion is advised as they say. Permian Extinction Caused By Halogenated Gases? Happy Birthday to Philip Currie!